(Best viewed on black,. . . just press "L" on your keyboard). :If too many people try to take charge at a task, the end product might be ruined. 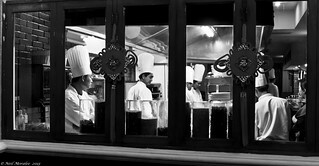 Candid shot through the kitchen window of a restaurant in Ho Chi Min City (Saigon) Vietnam. The food was actually great.